Stir in sauce. Heat to boiling, stirring occasionally. Unroll can of crescent rolls. Place in ungreased 13x9 glass dish. Press in bottom and 1/2 inch up sides of dish. 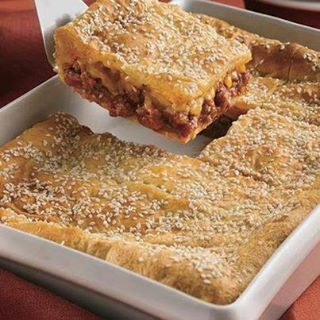 Spread beef mixture over dough. Unroll second can of crescent rolls and place over cheese. Bake 30 to 35 minutes. Cut into 8 squares.